My life is starting to resemble a country song. We had to put my old dog down, two of my appliances died, our car was in the shop and we got a ticket for parking in front of a hydrant, bills are piling up and to make matters worse, I’ve had a throat infection that’s only getting worse which means I’ll have to go back to the doctor for another appointment. As Dave says, there are weeks when the happy act should really be The Crappy Act. It’s made me reflect on how to keep chipper when life gets you down. Here are a few things that work for me. Taking care of myself. Easier said than done, but I’ve always been a huge advocate of listening to your body, and when I’m feeling poorly I try to slow down and take care of myself. Note to self: make another doctor’s appointment tomorrow. Being grateful for what I have instead of what I’ve lost. I loved Murphy our old dog, but we still have our Great Pyrenees, Bella, the stupidest dog on the face of the planet. 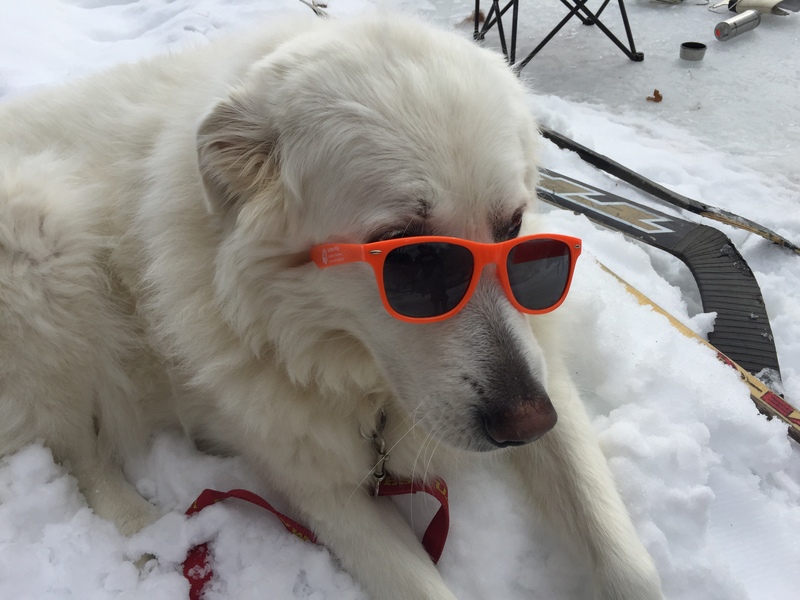 Even though her various nicknames range from Bella the Fart Smeller, to Bella the Drywall Eating Dog, to the Bellidiot, we still love her and I’m grateful my big fluffy polar bear of a dog is still here to greet me every night when I come home. Remembering that no matter what challenges we are facing, there is someone sitting next to me dealing with far more serious issues. I was reminded of this twice this weekend. Knowing this too shall pass. Oh, and chocolate and ice cream don’t hurt either (and are cool on the throat). Hope everyone else had a happy week….and thanks for the kind words about Murphy. Our gentle giant is in a happier place. How well do you bounce? Here’s a riddle for you. What do Taylor Swift and Wipeout have in common? They are teachers of resiliency. My kids love Wipeout, that show where people jump from huge balls in a wacky obstacle course. Inevitably, they get knocked down, and the audience waits to see how quickly they can get back up and complete the course. We all get knocked down in life. It’s how you bounce back, or in the words of TSwift, Shake It Off that is a real test of character. If you can develop resiliency, you’ll have far greater chance of being happy. Here are 7 things I’ve found has helped build resilience. Always look for a silver lining. No matter how bad things are, see if you can see a positive —what did you learn about yourself or the other person if someone else is involved, or maybe just be proud of how you handled the situation. Believe all things happen for a reason. This has been a personal mantra of mine for years. It leads to acceptance faster, and then you can move on. Share the load. The first thing Dave and I do when we have a bad day is unload on each other. It’s one of the things I love most about him—that no matter what happens, I can come home and share my feelings and he will always listen and support me. Be self-aware. Take time to deconstruct what happened and why it affected you the way it did. Don’t dwell on the past, but be self-aware to learn and grow. Read my earlier post on developing emotional intelligence. Refocus on what’s important. Once you’ve deconstructed the event, focus on the future and what’s next. Set goals. Decide where you go from here and take decisive action. Recharge your batteries. When we’ve been knocked down, it takes a toll, both physically and emotionally. Take time to recharge your batteries. Go for a walk, zone out, do something that will help you get your inner strength and resolve back. Laugh in the face of adversity. This one’s easier said than done, but sometimes forcing yourself to laugh or trying to find humour in the situation can help. This week’s #HappyAct is to think about how resilient you are. 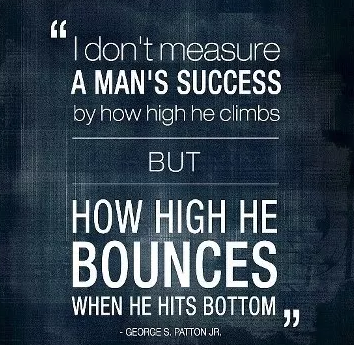 When you get knocked down, how fast do you bounce back? Try some of these tips to help build your resiliency. Leave a comment–how do you stay strong so you can bounce back?